Like a Miata, only it comes attached to a vacation in Italy. I have this rule about driving convertibles with the top up. I simply don’t do it. If the weather’s so awful that a vinyl roof will make a big difference in comfort, I leave the car in the garage. That’s why my dad was laughing so hard when I arrived at his house in Phoenix after a drive from Los Angeles one Christmas. The thermometer read 32 degrees, and the tonneau cover concealing my unused softtop was encrusted with ice. So was I. What I wasn’t about to tell my father was that in the cruel stop-and-go traffic trying to escape L.A., I lost first gear when the linkage went out of adjustment. Shortly after, I lost second gear, too. I made it across the chilly desert that night by promising my little car a transmission rebuild if we ever managed to get back home, which we did eventually. I bought my Alfa Romeo Spider years ago from a friend. When I saw it for the first time, a tingle went up my spine all the way to the top of my head. Silver skin stretched over a low, long spaceship. The steeply raked windshield made it look fast even while parked, and the plexiglass Carello headlight covers rounded out the nose. I slipped into the driver’s seat behind the elegant wood-rim steering wheel, and my right hand instinctively grabbed the shift lever. 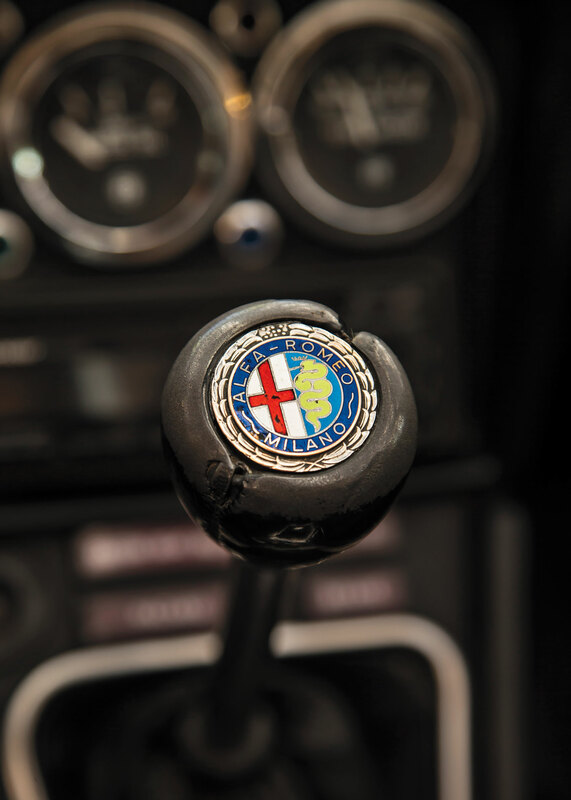 The shift knob carries a cloisonné badge of the Alfa crest, which depicts a dragon (some say snake) consuming a male unbeliever. Pininfarina styled the all-steel unibody Spider to slip through the wind. The carrozzeria also built the bodies and assembled the car. Just like the Porsche 911 of the same era, the Alfa Romeo Spider evolved in specification as carburetors were supplanted by fuel injection and slim chrome bumpers were replaced by large rubber cushions, yet the same classic specification and shape always remain identifiable. Each generation of the car enjoys a healthy fan base: Duetto, Veloce, Junior, Aerodinamica, Quadrifoglio, and the Series 4. 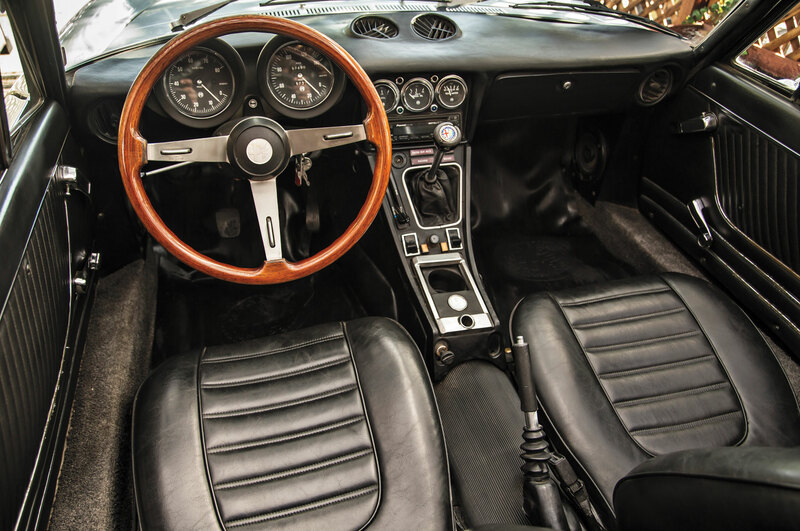 My 1974 Spider Veloce 2000 is one of about 35,000 produced from 1971 to 1982. The classic 2.0-liter twin-cam Alfa engine puts out only 129 hp and 130 lb-ft of torque, yet this is more than enough with only 2,292 pounds to move. The car gods are fast at work engraving the headstone for the manual transmission, but what makes the Spider so exciting is that it’s a shifty. I listen for the top of the engine’s rev range and then slam the crisp mechanical transmission linkage into the next gear. Sometimes I’m Dustin Hoffman in “The Graduate” (1967), sometimes I’m Michelle Pfeiffer in “Tequila Sunrise” (1988), and sometimes I’m Angelina Jolie in “Gia” (1998), all famous cinematic examples of Spider enthusiasm. The Alfa Romeo Spider also speaks to me of Italian culture. My first car was actually a scooter—a blue 1959 Vespa rebadged by its Sears sales outlet as an Allstate. I bought it in 1985, back before replacement parts were a simple mouse click away, so I always opted to fix it myself. The necessity of working on my own scooters eventually led me to opening my own shop (with a partner), which is dedicated to vintage Italian scooter repair and restoration. Our shop is packed with classic Italian stunners—Vespas, Lambrettas, and even a Benelli motorcycle. Just like a scooter, my Alfa Romeo Spider Veloce 2000 is simple and timelessly elegant. And just like a scooter, most repairs and maintenance can be done in the driveway. For instance, I replaced the Spider’s stock Spica fuel-injection system with twin Italian-built Weber carburetors in an afternoon. The Spider adds a little Italian sophistication to everyday life. Rare are the days one can cruise the sun-dappled country roads of Tuscany or visit Verona for espresso and biscotti at a posh outdoor bistro. Yet I can wrap my head in a diaphanous scarf, don sunglasses and driving gloves, and stomp on the gas pedal with a Prada stiletto, transforming the mean L.A. streets into an Italian daydream. You’ll get no such experience in a Mazda Miata. 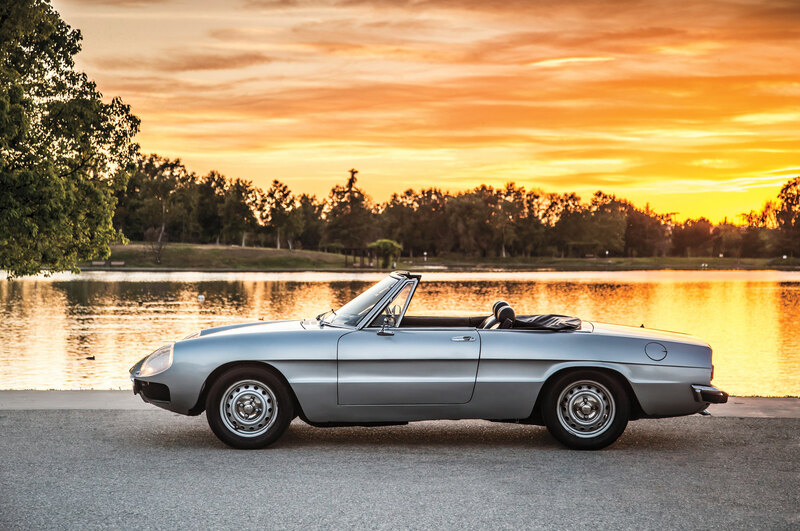 The Alfa Romeo Spider is the car you dream of driving when you’re 15. It’s also the car you wait until 50 to actually own because it’s too expensive for young drivers, too impractical for families, and too selfish when you have more than one friend who needs a ride. But once you hit the age of “What happened to my youth?” such reasons no longer matter. It’s dream-fulfilling time. This isn’t the first Alfa I’ve owned, and it certainly won’t be the last. We’ll see how our new Four Seasons Alfa Romeo 4C measures up against my 1974 Spider. 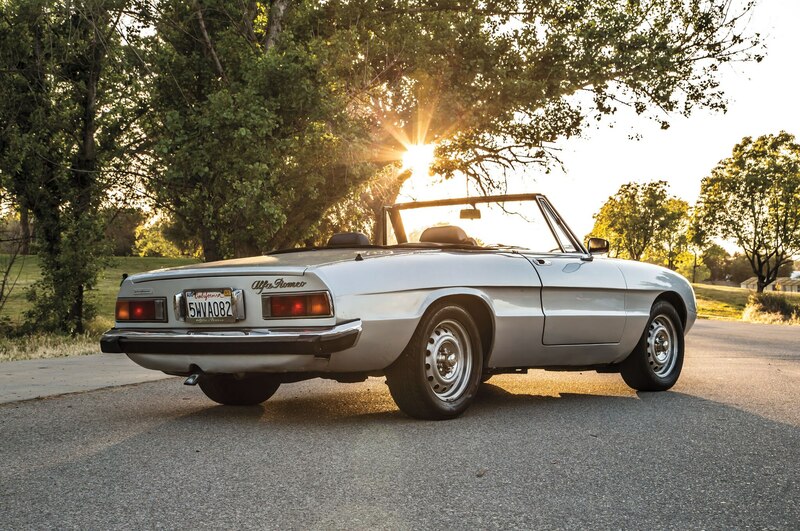 Now that Alfa Romeo has returned to the U.S. market, there are more reasons than ever to embrace this classic convertible of the ’60s and ’70s. Middling examples of this refined, well-equipped car can be had for less than $10,000, and most major urban areas have Alfa Romeo repair shops. 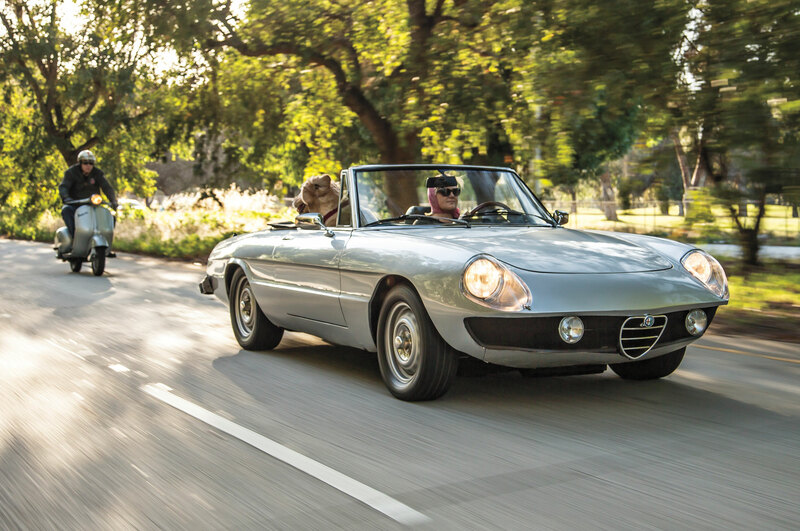 With a growing pool of Alfa Romeo owners in the U.S., values for the Spider also might rise. Although the Spider is spirited like a Miata, this is actually a larger, more substantial car than the Mazda. 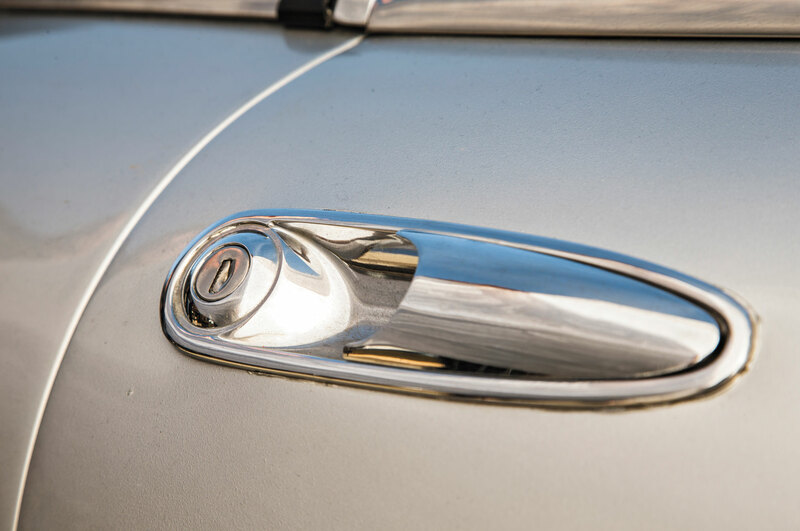 And there’s more style and charm in its front badge than any stuffy, overpriced Austin-Healey, MG, or Triumph. 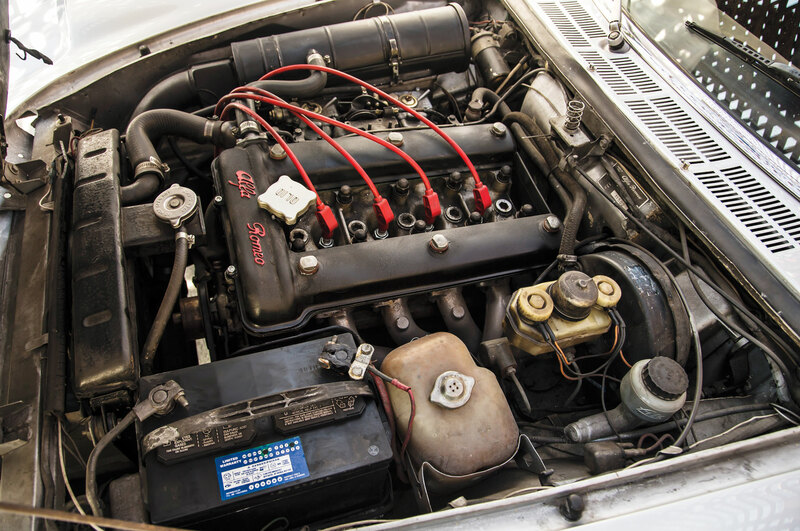 Alfas are robust and reliable when it comes to the mechanical hardware, and they do not seem as susceptible to rust as Fiats or Triumphs of the same era.